In the distant past, many Maori tribes lived along the rich river flats of the Wairarapa valley and beside the main tributaries of the Ruamahanga River from which the name “Ruamahanga”, meaning “many tributaries”, is given. Among its other meanings, Rua means “two” or “both” and Mahunga means “either” or “two”. For the purpose of our legend, we will assume that the river was named for the sisters, Rehutai, or mist of the breaking surf” and Tangimoana, or “the voice of the breaking surf”, who lived beside the river near Te Whiti. So beautiful were the sisters that men were afraid to court them. They were proud maidens and enjoyed the power over which nature had endowed them. One day a handsome Wairarapa warrior named Rautoroa, or “plume of the albatross”, having heard of the beautiful twins came to their kainga with gifts. Both girls were impressed with his looks and bearing. Their hearts went out to him and soon the sisters became jealous of each other. Rautoroa did not know which girl to marry so he decided to bide his time. Rehutai asked her sister to fetch a calabash of water from a spring nearby. Tangimoana re fused to go unless her sister went with her as she did not relish the idea of Rehutai and Rautoroa being left along together. Rautoroa told hem that his thirst was so great that he needed two calabashes of water and so the two girls agreed to go. When they came to the pool where the water was cool and clean, Tangimoana filled her calabash and then she pretended to stumble, disturbing the water and making it muddy and foul. Then she ran back to Rautoroa, leaving the enraged Rehutai to wait until the water had cleared before filling her calabash. 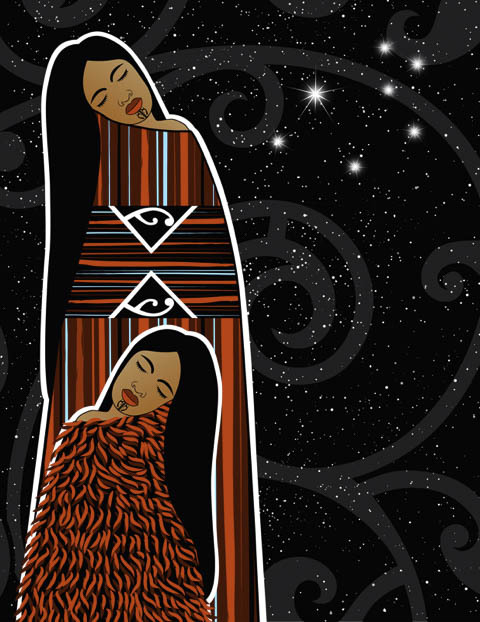 When she returned she found Tangimoana wearing Rautoroa’s cloak, which according to tradition made her his wife. Flinging the calabash aside, Rehutai snatched the whale-bone club from Rautoroa’s belt with the intention of killing her sister, but the love for her twin sister so overwhelmed her that she replaced the club and turned away. Making her way to a secret spot, she wept bitterly and made a mourning wreath of leaves for her head. At dawn she left her kainga and walked until she came to a hill. She slowly climbed the hill until she disappeared into the mist and cloud at its crest and she was never seen again. The hill is now known as Ohine-mokimoki, the place of the lonely girl.